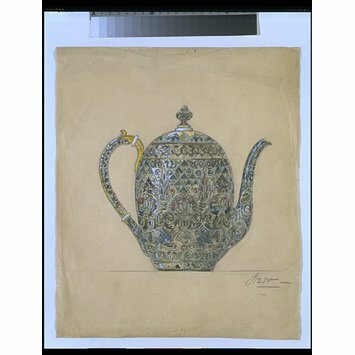 This presentation drawing for a cloisonne enamel pot was probably drawn by Fedor Ruckert for the firm of Carl Peter Faberge. The work master of Faberge's enamelling workshop in Moscow, Ruckert was known for his skill in cloisonne enamelling, a technique which was unique to the Moscow workshopp. The shape of the pot is not unlike a Faberge egg which has sprouted a handle and spout. 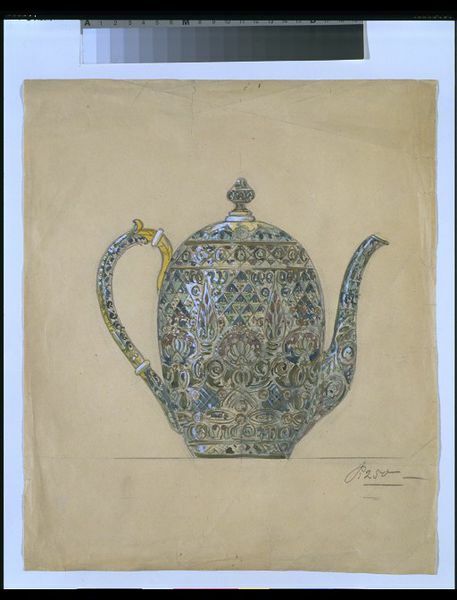 Like the famous eggs, the ornate decoration of the teapot makes it an ornamental piece rather than a practical object. The busy intricate pattern of a mixture of floral and geometric forms is derived from the Old Russian style, which had its beginnings in the 17th century. Enjoying a revival at the end of the 19th and early 20th centuries, this style was linked to Russian nationalism and suited Faberge's more traditional customers. Ruckert's designs with unusually muted colours had a modern touch to them and some had suggestions of more Art Nouveau influenced forms. 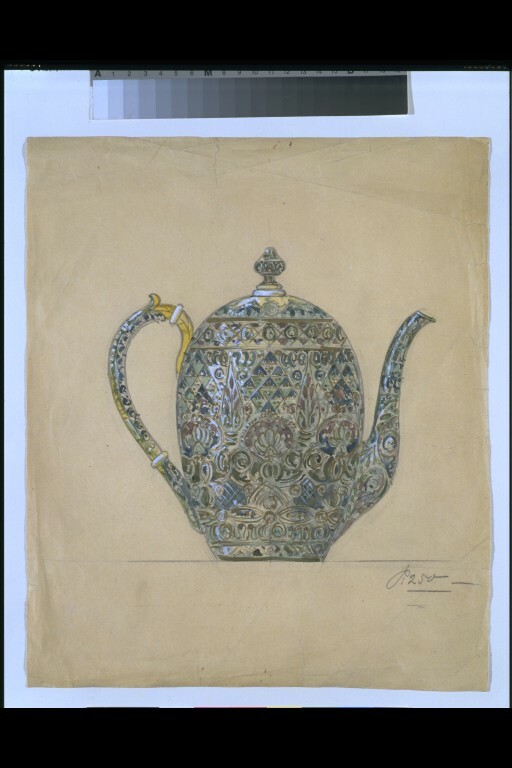 Notes: Fedor Ruckert was the work master of Faberge's only enamelling workshop in Moscow. This design is close in decorative style and form to a number of surviving pieces marked by Ruckert and datable by their hallmarks between 1908 and 1917, and echoes their 'old Russian' decorative style. The inscription refers to the price of 250 roubles.